In these Spotlight discussions, we sit down for a chat with the individuals that make up the Unimutual community, to share the experiences of the parts that make up the whole. What is your involvement with risk management? 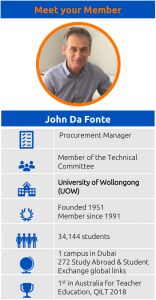 I’ve been at University of Wollongong for approximately ten years: I look after procurement, and insurance is a part of that. The renewal process is my responsibility – I report to the Financial Services Director, and part of my role is to make sure the University is adequately covered by insurance and provide advice to staff and students. How would you characterize your University’s approach to Risk Management? We take risk management very seriously. A good example is our response to several property claims we’ve had over the years, where our Facilities Management Division undertook measures to make sure mitigation was put in place to avoid a similar incident. We take pride in that! We also make sure to action the recommendations that come out of the Mutual’s risk audits each year, because it’s very much in our own best interests to do so. What do you consider to be the biggest risks facing your Institution? Aside from cyber, climate change, and so on, there are other possible issues such as reputational risks, dependency on foreign students, and investing overseas. There are also risks associated with a greater focus on research, which can mean bigger exposures. I think it’s more important than ever to have a good firm that is honorably representing you and offering good advice on those exposures, especially with internal pressures on staff and resources. Why did your organisation decide to join Unimutual? The University of Wollongong has been a member of the Mutual from inception, right from the start or soon after. It was quite difficult for universities to find the right sort of cover and protection at that time, so It made sense to have a Mutual that focused on the University sector to represent the University. I believe the decision to be part of the mutual membership made a lot of sense back then – and still does! What drives its decision to stay? I believe what sets Unimutual apart is simply that it is a Mutual owned by the members, and it understands university business well. Universities are complex, constantly changing and evolving, and the Mutual has the ability and the flexibility to be part of that journey – that’s what sets it aside. It takes time to build a relationship with your risk protection provider and get to a position of trust –it’s not just about how cheap you can buy your insurance, it’s about what you get for your service and how they represent and understand you. As universities grow and become increasingly diversified in terms of what they do in research and other areas, they need to make sure they are fully, properly covered. They are quite different from other markets, and their needs are quite specific. There’s always something new coming out – and that’s why we enjoy the relationship with the Mutual, because we put our trust in them to guide us through those new projects. What does it mean for UOW to be a member and part of a mutual? You don’t see the Mutual as an insurance provider, we see the Mutual as a partner there to represent Universities. They are the experts in the field, and it’s comforting to have their expertise to rely upon – the managers understand what universities are about. For me, coming into the University sector ten years ago, taking over the insurance portfolio and not knowing much about insurance, it was reassuring to have the Mutual there to rely upon. It is owned by the members, and has the universities’ best interests at heart – and it utilizes the buying power that the universities have together. Rather than going out alone, you are going out as part of the Mutual with other members, increasing your buying power, and increasing your access to knowledge across the university sector. What services from Unimutual do you rely on or benefit from? There’s a wealth of valuable resources available on the website, these include checklists, forms, guidelines and procedures. The regular communications such as emerging risks, newsletters and updates are valuable. Risk management services are key to identifying significant exposures. We have a lot of individual communication with the Mutual throughout the year, from myself and our Legal Team. In what areas does your membership make a notable difference? There a number of things that contribute to the overall experience. From the seamless experience with data collection to the claims handling process, the experience has always been rather positive. Both our Legal Team and I utilize the Mutual’s services on a regular basis throughout the year: it’s important to us to have the managers basically on call, and always ready to offer their expertise. What does UOW contribute to the Mutual in return? I’m a member of the Technical Committee, and our Deputy Vice-Chancellor (Research and Innovation) is on the Board of the Mutual. In terms of sharing knowledge, we communicate emerging risks back to Mutual by various means and where possible participate in member forums and networks. Finally, what do you value most about your membership? What I value most about our membership is the comfort of knowing that we’re in good hands. I put my trust in the Mutual – “the Managers” – to provide the best advice and protection for the University. What difference does a mutual make? We recently asked Unimutual Board Member Scott Jenkins what being a member means to Australian Catholic University – read the full interview here.